It already embeds the components which will be available in the final 0.8 version running with Helios. Today I would like to focus on two new components (Query Manager and Facet Manager) and how they are used by the new version of the Model Browser to allow defining custom (and dynamic) viewpoints on your EMF models. These mechanisms have been developped to support understanding of complex models automatically created from legacy source code. But you can also use it on "classic" EMF models created manually with graphical tool such as Papyrus. This is a new component providing a facade to evaluate queries against an EMF model independently from the query mechanism. 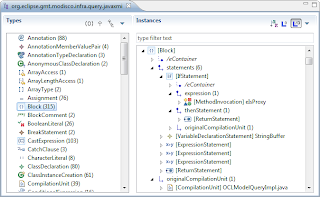 Implementations are provided to call queries written in Java, EMFQuery, OCL and XPath. This new component provides a mechanism to dynamically extend EMF model elements by adding "virtual" attributes and relations computed by queries. 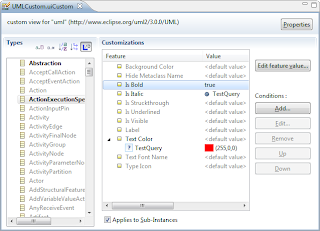 The look & feel has been reviewed to be more compliant with Eclipse UI checklist. With the new version it is possible to dynamically customize how the EMF model elements are displayed. Any customizable feature (label, color, icon, police, ...) can be set statically, or dynamically using a Query executed on each element to display. If you want the Query to be always executed on each element of the same type, you can define a Facet to see the Query as a virtual type, attribute or relation in the browser.